Easter is almost here, and there’s no time like the present to get your carrot cake-making skills on point. But we’re going to let you in on a little secret — you can enjoy all the mouthwatering flavors of a good carrot cake outside of the cake pan. 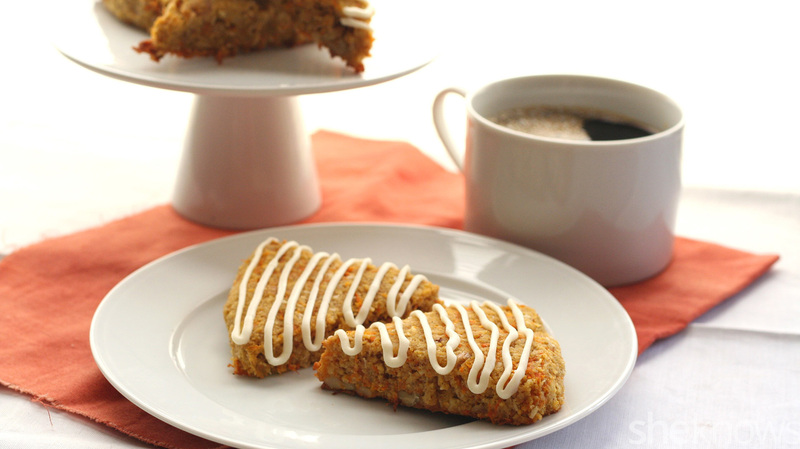 These carrot cake scones can also be made as muffins or cupcakes to complement an Easter brunch. If you’re on a low-carb or gluten-free diet, never fear. You don’t have to abstain from all the carroty goodness. 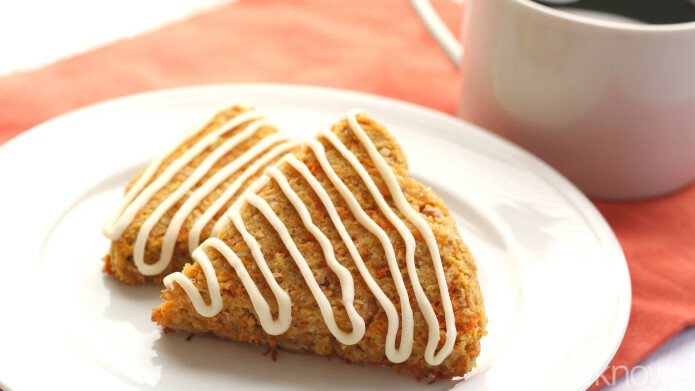 These scones are made with almond flour and contain no added sugar. You are free to indulge and enjoy. Nutritional information: food energy, 314 kilocalories; saturated fatty acids, 10.56 grams; total fat, 27.20 grams; calories from fat, 244; cholesterol, 49 milligrams; carbohydrates, 19.16 grams (9 grams carbs from erythritol); total dietary fiber, 4.99 grams; protein, 8.85 grams. Total net carbs = 5.17 grams. In a large bowl, whisk together the almond flour, shredded coconut, walnuts or pecans, sweetener, baking powder, cinnamon, salt and cloves. Stir in the shredded carrots. Add the eggs, butter and vanilla extract, and stir until the dough comes together. Turn the dough out onto a prepared baking sheet, and form into 2 low, flat circles about 7 inches in diameter. Cut each circle into 6 even wedges. Gently lift the scones with a spatula, and spread around the baking sheet about 1 inch apart. Bake 20 – 25 minutes or until golden brown and just firm to the touch. Remove, and let cool. In a medium bowl, beat the cream cheese with the sweetener, cream and vanilla until smooth. Cut just a small tip off from the corner of a zip-top bag. Spoon the frosting into the bag, seal, and then pipe decoratively over the cooled scones.